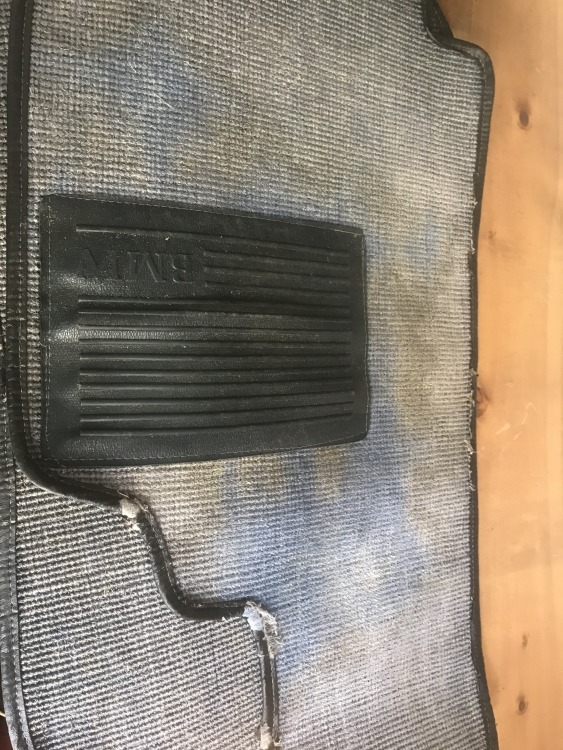 My 02 had a cheap aftermarket carpet in it when I bought it. The carpets need to be replaced so I’m looking for guidance on the correct color/pattern. My car is 1969 year with marine blue interior. The aftermarket carpets (replaced in 80s according to PO) are salt and pepper. This seems consistent with what others have talked about on these forums as being correct. That said, I found these mats stored with the spare tire. They show blue square weave. So my question is... was the blue carpet original to the car? 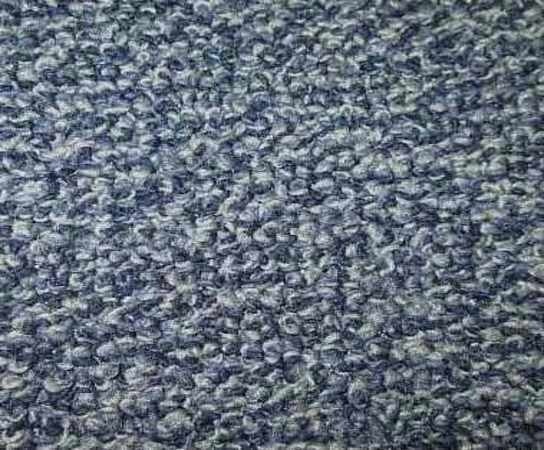 A 69 would have the thin perlon style carpet, later on it would be german loop, and never square weave but that is a nice choice in terms of durability. I'm not sure but I think it would have been blue. The salt/pepper, blue/grey carpets are all german loop. I'm open to other opinions. My very early 1970 (VIN 1668093, manufactured September 8, 1969), Chamonix with Marine Blue interior, had salt-and-pepper carpet. The car had about 20,000 miles on it when I purchased it in 1973, and the entire interior was un-marked, so I believe the carpet was original. I wish the ‘02 world would move beyond the “salt-and-pepper” terminology, which implies white and black, whereas the ‘02 carpet to which we refer is actually light- gray-and-dark-gray. At least the US spec '69 cars had the "square weave" style carpet that was identical to what was used on all subsequent roundies. That's what my Feb '69 production car has, and the carpets are original. Your carpet color would be dependent on the car's original exterior color. US 69's only came in five colors (unless ordered overseas by military or diplomatic personnel) as that's all Hoffman would import: Granada red, Chaminox white, Nevada greyish tan, and...at extra cost Polaris silver and Baikal blue. These latter two were metallics. Your marine blue interior would have been paired with Chaminox, Polaris or Baikal. Granada cars had a black interior and Nevada had tobacco. Let me know your car's original color and I can check my '69 sales literature. My car was Charmonix originally. Thanks! 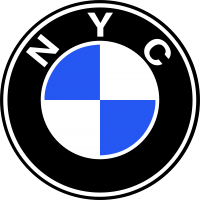 The BMW 2002 US VIN 1666597 was manufactured on June 19th, 1969 and delivered on June 27th, 1969 to the BMW importer Hoffman Motors Corp. in New York City. The original colour was Chamonix, paint code 085. Slightly off topic, but my car is an early '71 Riviera blue with black interior. It has the original S&P carpet in it, and I hate it. It just doesn't blow my skirt up. I'm considering going to black carpeting. Not the original configuration, but I'm not sure I care. Steve, The carpet was German Loop, correct? I’ve never seen square weave in a 2002. My 69 had the thin mousie brown color carpet, body was Manila and definitely not ordered for overseas delivery. Yes, Chris, the carpet on my ‘70 was German loop. I recall that carpet very clearly on account of three things, all surprises to me because the ‘70 was the first BMW I was ever inside: (1.) unlike an American car of that era, the “salt-and-pepper” carpet (I use that term under protest! ), (2.) the individually-bound components that comprised the carpeting, and (3.) the cool nickel-plated(?) snaps that secured some of those components. The carpet was German Loop, correct? I’ve never seen square weave in a 2002. I think we're talking about the same thing. It is a loop pile (as opposed to plush) but it is a square weave. Look at the back side or at a spot with some wear and you'll see the "squareness" of the weave--it's just hidden by the loops. Well, at least Nevada is one great color, Mike! The more stories I hear about Hoffman Motor Corp, both regarding BMW imports and his other European imports, there were two different, and conflicting, business practices: (1.) a theoretical practice to simplify the importing business and build volume, e.g., only officially offering 5 colors of ‘02’s, and (2.) a willingness to special order anything for a friend, or a friend of a friend, or...you get the picture. In this particular case, however, Chris suggested that his ‘69 might also have been a Euro-spec car, and not a “Hoffman special order”. My Manila 02 was a US spec car sold in Alhambra CA in Feb of 1969, built Nov 1968, 1164169. I have seen many Manila 02s in SoCal over the years, Hoffman also imported the Neue Klasse 2000 sedan in Manila. Thanks Mike, squareweave is a much denser weave than loop, standard in cars like Porsches and MB 230SLs of that era.